A woman attends her funeral and watches. A dangerous drug pusher adopts a 15-year-old homeless kid. A short-staffed emergency room grapples with an extraordinary birth. These and other stories come together in this series of interconnected gems whose characters converge on the imperiled future of a promising young man. 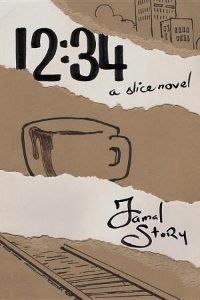 A slice novel with a mysterious peek-a-boo narrator, "12:34" weaves diverse narratives to create a poignant journey that considers the permanence of human actions and their importance in the universe.